The Annual General Meeting of the ICT Supporters Trust (Inverness Caledonian Thistle Supporters Society Limited) will take place in the ICT Social Club, Greig Street, Inverness at 7.00pm on Thursday 13th December 2018. It is hoped that the first part of the meeting (20 to 30 minutes) will be taken up by a presentation to those in attendance. We are awaiting confirmation from the persons doing the presentation on their ability to attend. On that basis, members should arrive ready for the meeting to begin at 7.00pm. We are pleased to confirm that John Robertson will be in attendance from 7 till 7.30pm on Thursday for a Q&A with Supporter Trust Members attending the AGM. The board is happy to have 30 mins taking questions from the floor following the close of the meeting. A copy of the full notice and related documents can be downloaded by clicking here. Due to insufficient numbers, tonight's AGM was not quorate and the meeting has been adjourned until Thursday 13th December, 7pm at the ICT Social Club, Greig St, Inverness. This meeting will go ahead regardless of numbers, with those in attendance being considered a quorum. The Q&A went ahead with Robbo who was as candid as always and give some great insight into the playing side of things at the club...our thanks to him. It would be good to have a resume of the Q & A session with Robbo or is that considered to be only for the Elite and not the Masses ? Neither the Q&A last night, nor the opportunity for fans to attend a similar event with Robbo at the club last week, could have been considered "only for the elite". It would be interesting and useful to get your feedback on why you think this may have been the case. No formal notes/recording of last nights Q&A were taken, but there's nothing stopping those in attendance sharing if they wish to do so. Although I have no involvement, that raised an obvious question. On checking, however, you are indeed empowered to do that. 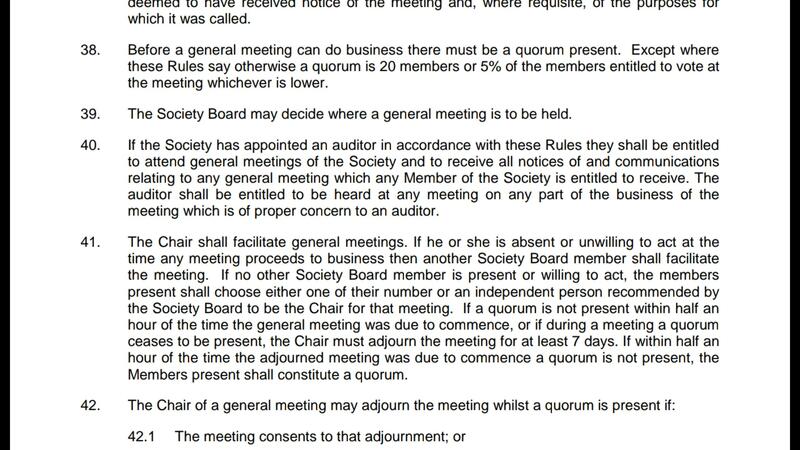 Provided that you wait until 7:30pm if a quorum is not present before that time. I'm quite happy to sing a few songs or read a bit of poetry if people wish to be entertained. How many attendees constitute a quorum ? What a ridiculous question. Nothing elite about sitting at the Caley club in an AGM. OK Fraz but I just thought there might have been some useful comment from Robbo that could be shared, not all of us can attend as easily as those resident in Inverness. The Q&A was part of the meeting surely there must have been something worth telling us and I am sure many of us would be interested if there was anything worth passing on. There has been so much talk of the Board not being open with information I thought that the the supporters trust would be a bit more forthcoming. Polworth will have to take a pay cut to stay on next season. Mulraney's contract from the old board was mental, apparently if we didn't get rid of him, he had a clause in his contract where his wages would double. Contract's handed out by the previous board had some mental clauses in them in general. The 'Bank of Dingwall' gave us 100k for Draper. We were in for strikers who are currently playing in the Championship, wages agreed but agents scuppered the deals wanting their 10%. We offered one particular player £600 a week but was told United 'offered double'. Extremely hard to attract established players, we had to approach young, single players with no central belt ties. Hence Rooney, Walsh, Chalmers. We are 6/10 in terms of first team budget. Those with a bigger one are United, County, Partick, Falkirk and Dunfermline. We can never get the Highland Football Academy as County block book it whether they use it or not. Robbo is against using Hearts youth players on loan as they probably won't be better than we have and if we did use them, it would **** off the signed players. Plus is is extremely excited about Danny McKay and Roddy MacGregor. Lovely to see some wording associated with the Supporters Trust ? Mulraney's contract from the old board was mental; Contract's handed out by the previous board had some mental clauses in them in general; We offered one particular player £600 a week but was told United 'offered double'; Extremely hard to attract established players, we had to approach young, single players with no central belt ties; We are 6/10 in ﻿terms of first team budget. Sounds like Robbo has a good liaison with the Board and understands the financial constraints. Looks like Rae and Crook may be actually doing a good job in difficult circumstances. It was a really interesting session with Robbo last night. He was honest and forthright and didn't duck any questions. In addition to the excellent summary from ICT-Stew, Robbo spoke of his concerns about the pitch which he described as "gone". We can see that with our own eyes and there are clearly major decisions to be taken by the Board in relation to that. Interestingly he referred to the astroturf facility the Rugby Club have and he described that surface as "magnificent". In talking about finances he indicated that he has reduced the wage bill by over £1million which seems an astonishing amount for a club of our size. He also says he has cut down on payments to agents from about £100k to just £9k! I like that! But with no regular investment (donations) coming into the club, he felt there is a need to do more to attract people, particularly young kids to the games. This may be an area where the Supporters Trust can work with the manager to explore various initiatives with the club. On the player front, he said that Angus Beith was now just a couple of weeks away from being ready for selection. We'll keep our fingers crossed that it will be worth the wait. Also, OFW is back and whilst he apparently would prefer to play in the States, nothing has come up yet which he wants to sign up to. If nothing by way of a loan deal for him comes up in January then he would come back into the squad as our highest paid player (I think) until his contract expires. In that case, young Daniel Hoban would likely go out on a loan deal. For me, the over-riding message was that the club has to be realistic about the kinds of contracts it can afford and we all need to understand that we are very limited in terms of the kind of players we can bring to the clubs. Seasoned pros, particularly those with families to relocate, simply are not going to move up here for the wages we can afford. We therefore need to attract younger lads who show potential but who, for one reason or another haven't quite made the grade elsewhere. We have to accept that if they make the grade here, then likely they will move on to in due course. The other route is to develop our own and he spoke with great enthusiasm about the youngsters currently coming through the system. As I say, a very informative and interesting session. I am sure he will be willing to come to Q&A sessions again and I can assure you, it will be well worth the effort to come along and hear what he has to say. Thanks for the info would love to say i am surprised but not What the Hell the previous board were thinking off ? Was it no bad enough Mr Cameron would not sack Foran and walked straight into relegation then fecked off but Mulraney's contract WTF ?? It seems quite amazing that the "previous board", whoever that encompasses can leave a veritable trail of destruction in their wake and not be held accountable for doing so. These were people who ran their own business but yet seemed to leave the business brain at the door when they enter TCS. Did any of them run their own empire in this manner? No would be the short answer. Chicken and egg - quite honestly, if the club had funds I would be suggesting that the individuals concerned for this situation be pursued and held accountable personally. There is an obvious concern for any incumbent directors if the club gets into financial difficulty as you need to then disclose your involvement in any business which has gone into liquidation etc going forward - most of the new board have inherited a sh1t storm which is not of their own making. On the plus side, I always find Robbo to be very direct at player sponsor evenings and he never ducks a question if he knows the answer - respect for that - and his comments seems completely in line with what most of us are thinking. To be left with OFW seems bizarre and again a legacy of the ludicrous contracts issued by the "old board" - were they blinded by a season of success where the stars aligned for us for once??!! The previous board certainly do bear a share of the responsibility, especially in their final two years. However, to give them credit, they also delivered two major cup finals and one very shiny trophy, numerous top six finishes, European football and several years of pulling off the remarkable feat of turning a modest profit. Many people bear responsibility for where we are now. The important thing now is that we find the right people committed to putting it right. for those making a distinction between "old board" and new board, just remember that we did not replace the board en-masse ... it was more of a rolling change over a number of years and some of the new board could also be considered as being part of the old board ! its not as simple as its being made out to be. Did the 'old' board make mistakes ? yes, they did. Has the new board? yes to that also. In fact, every board has likely made a ton of mistakes (considering we almost went to the wall twice). The one thing they all have in common I think is that they all thought they were doing what was best for ICT at the time. The board led by KC was trying to keep us in the premiership and was operating on a higher level in terms of revenues and costs and it appears that some silly contracts (for us) may have been handed out, but those contracts might have been sustainable in the premiership if we had remained ! The board led by GR is a board in the championship and although off to a rocky start - in my opinion - have started to pull some things round. They have come in for flak from several corners, including me, but more recently there have been a few things where they have been worthy of praise. The main aim is to cut our cloth to suit our pocketbook and we have done that before. Its maybe harder this time since we are used to premiership players and performances. If the aim is to steady the ship and build from there to get us back to the premiership then I am 100% behind them. If it is to be happy with our lot as a championship side then I am not. To kick it off I doubt whether any of us, even given the availability of a Tardis, would have changed one bit of the post merger histories of Caledonian and Inverness Thistle - from the agonies and soul searching of the initial post merger years through the unbelievable climb up the leagues, the momentous giant killings en route, culminating in a Scottish Cup victory and a surreal jaunt, albeit brief, into what many of us would have termed the UEFA Fairs Cup. As we progressed we were undoubtedly abetted, financially backed (perhaps saved) by injections of cash by a number of previous Board members and one in particular. But to me the Boards were blinded by the light, they spent in an attempt to try and secure a position which was probably well above our potential without a bonafide Sugar Daddy. To me their biggest downfall was that they were "weak". They rolled over like starstruck puppies when played with by the likes of Brewster, moreso Butcher and again by Yogi. Three very big egotistical control freaks. To me Brewster had many positives but he was aloof. Butcher is a textbook narcissist which augured well at the off. We will never be associated by a bigger name in our history. He became the Mr ICT of the media and he wallowed in it. He brought in players through his name and reputation and was abetted by the one of the best scouting system ever in Scottish football. But he was ruthless and his personality scared the crap out of the Board. He probably started off our rise to the top but he also put us on a perilous financial slope. When the Board had a fit of realism and tried to pull back the reins he fecked off and in true narcissistic fashion didn't give a feck what he left behind. So what did the Board do. They brought in a manager in the same vein and allowed him to repeat the process. Although it was feckin great and he also had his strengths. But we continued to overspend and whos fault is that ? Now that is why I get so frustrated over the criticism of the current Board. Yvonne Crook knows more about Marks and Spencers shopping ranges than football. Graham Rae probably thinks penalties are called free throws and you get three points for scoring a free kick from outside the designated box. They were brought in primariy to sort out the finances which is evidently a rotten and difficult task which probably annoys many at the Dump. But they appear to be getting there. Robbo is forthright and has a more personable and stable personality. He is a true communicator and knows his limits. Why is he still here ? Shure the Board were lacking in the communication skills but they have taken on Board people to carry out those roles for them. They take a back seat and let Robbo and the locally sourced Backroom staff to instill the "play for the shirt mentality". Scotty alludes to the future ambition. Of course it simply has to be an eventual return to the Premiership but stabilizing the finances and solidifying a place in the Championship has to be the initial goal. We have become accustomed to success but perhaps the realization is that a return to the Premiership may take a number of seasons and is dependent on an influx of extra finance. Your first paragraph is a rewriting of history through your own bias. Had we not got rid of JH we would never have been relegated. RF was unproven at ANY level an act of folly by the board who thought they knew something about football. Were you by chance one of those who was cheer leading for Foran? You reap what you sow,. Wonder how many "likes" that you will get ? We all have our personal opinions and you are entitled to yours and your evident bias. Of course RF was a mistake but that was a financially based decision as well. I would bet you that my perspective is more supported than yours - a responsible bet of course. Were you at the AGM tonight ? Please. Foran was ****, though most obviously wanted him to succeed still feared the worst (which was sadly realised) however being revisionist is something you are guilty of. We didn't get rid of JH to get RF in that's not what happened at all. We wanted to keep him, hence why we didn't allow him to speak to Dundee United. It all deteriorated after that though with his repeated slagging of the board publicly. That's only going to end one way, with his sacking. Foran was a mistake, a huge one no doubt and I said as much once to Kenny Cameron in that I felt he wasn't ready for such a role. What odds will you give me ? I had no idea you were capable of such wisdom!! !